love that coat!! such a great find. Wow I can't believe you guys are still getting snow! I'm kind of glad it's all over. I'm reading for some bare feet. You look so cute having fun in the snow. And that cat is gorgeous. I would not have believed it was thrifted and was made for a child had you not said so. That jacket is really cute! :) And polka dot slush? Who can hate that? you look so freakin' cute! I totally know what you mean about practical footwear. I too wore chucks through all types of weather till last year! Haha polka dot slush! I love the little jacket! I love that coat! 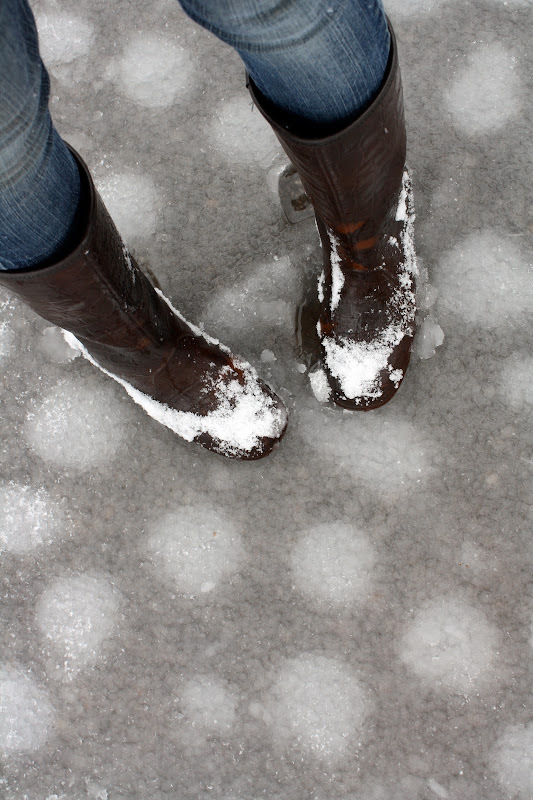 How did the ground get polka dotted? Hahaha! I love the pictures! Looks like you were having fun. That coat is adorable even though its made for a kid, who can tell? I can't believe the snow! You look lovely in that bell-shaped coat! These pictures are adorable! I love your new thrifted finds! you look adorable. I've been living in fl since i was in high school. your post made me miss the snow! and you always find such amazing pieces. how do you do it!? I love this jacket! I so would have got it too, despite the child size! And you are right: lifting your arms is so overrated! These pics are awesome. So much fun. Oh, and the hat! LOVE it! Those are polka dots... how cool! Way to enjoy the snow...wonderful photos! I like the fit of the coat on you! I big heart your jacket! There's nothing quite like fresh snow... Looks like fun! wow, the difference in your weather from one day to the next is so dramatic! I love this outfit and your photos! you manage to remain so cheerful when the rest of us are thinking spring! You look adorable! I love these photos, too - totally magazine-worthy! So adorable! 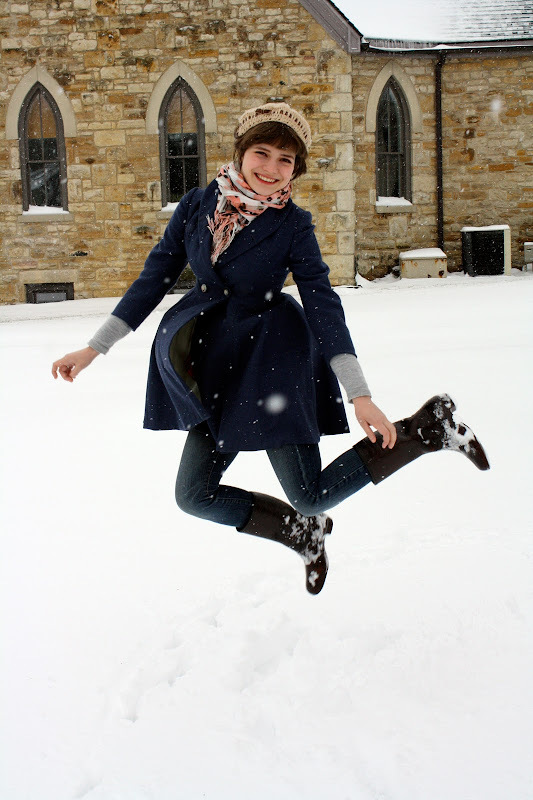 You really look like you're having fun in the snow--an admirable feat for late March. Great outlook on the wintry weather my friend! this is by far my favorite set of pictures of yours. you look so gorgeous and fun!! that jacket is amazing by the way...and 5 bucks, lucky girl. I gave you the Sunshine Award.. check out my blog for the details! 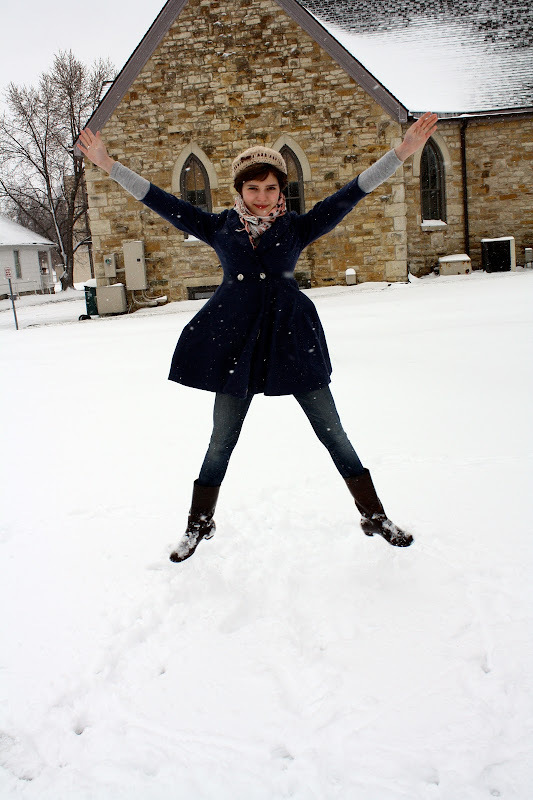 Aw, I love your cute jumping in the snow pictures! And that coat is beyond adorable!! that first picture of you is so great! you look so cute and happy!!! thanks for responding to my email about the thrift store stuff, i didn't get a chance to go because the snow was so bad last weekend we just tried to get back to the midwest asap. your outfit is full of great finds, esp your coat! 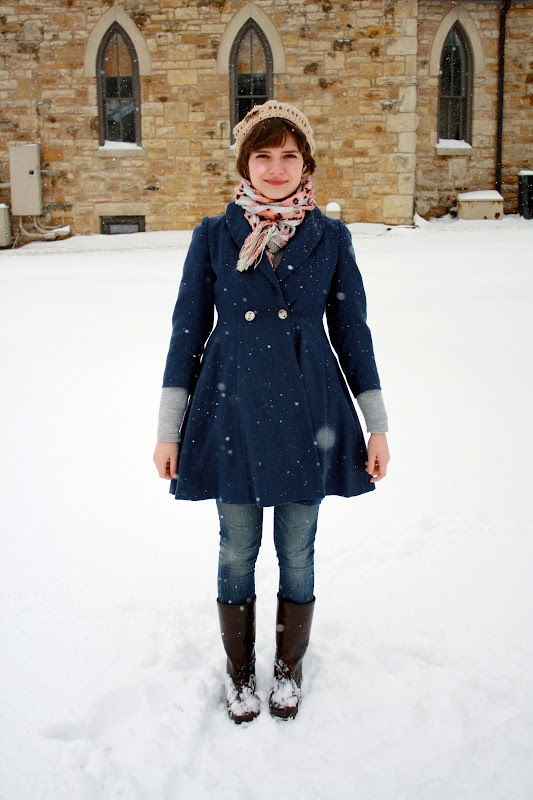 This entire look is so adorable and perfect for the snowy weather!! Amazing pics! Love your coat so much! it's all over. I'm reading for some bare feet. i would have never thought to rock the child's jacket ..love the look here !